Major Generals Grant and Sherman are not enjoying the summer of 1862. In their respective headquarters at Corinth, Mississippi, and Memphis, Tennessee, these two of Ohio are enduring sweltering heat, hostile neighbors, and unwelcome visits from Confederate raiders. On paper, Grant and his Army of the Tennessee occupy large portions of western Tennessee and northern Mississippi, with Sherman holding down the area around Memphis, with—assisted by Brig. Gen. William S. Rosecrans (another Ohioan)—holding down the rest. And “holding down”—or trying to—was about all Grant and his commanders could do. Before Grant’s predecessor, Henry W. Halleck, departed for Washington and the post of general-in-chief, he essentially disbanded the huge force he had assembled for his advance on Corinth. Committed to the European theory of winning wars by outmaneuvering the enemy instead of outfighting him, then holding onto captured territory, Halleck spread his forces thinly across the Western Department. “The great army…which General Halleck had so well assembled at Corinth, was out on the defensive,” Sherman wrote. That left Grant holding a lot of territory occupied by unfriendly civilians and crisscrossed by Confederate parties, unable to marshal a big enough force to launch a serious offensive. As a result, the summer in ’62 in the Western Theater was a quiet one, disturbed mostly by skirmishes and small fights here and there, the sounds of mosquitoes being swatted, and frustrated soldiers grumbling. When reports reached Grant’s ears that Confederate Gen. Braxton Bragg was daringly moving across the region with a significant force, the Union commander could only stand by in frustration. And Sherman recalled, “At the time when general Halleck was summoned from Corinth to Washington…I surely expected of him immediate and important results.” But Halleck could not deliver, and “important results’ in the Western Theater would not occur until Grant was turned loose. On Thursday, July 11, Maj. Gen. Ulysses S. Grant, had received a cryptic telegram from his superior, Maj. Gen. Henry W. Halleck. Halleck was commander of the Union’s Western Department, headquartered in Corinth, Mississippi. Grant commanded the Army of the Tennessee and, with headquarters in Memphis, was busy trying to suppress Confederate raiders in western Tennessee. It was a sullenly Confederate region the Union had reclaimed but was barely holding onto. Union victories at Fort Donelson, and Shiloh, Tennessee, as well as the takeover of Corinth, had supposedly wrested away chunks of the western Confederacy—but the Confederates weren’t quite ready to give up and leave. Halleck’s telegram told Grant, “You will immediately repair to this place [and] report to these headquarters.” Puzzled, Grant wired back immediately: “Am I to repair alone or take my staff?” Having had his command taken away from once before, Grant was understandably wary. He didn’t know that Lincoln had just appointed Halleck general-in-chief of the Union armies and had been ordered to Washington, where—among other things—he was expected to bring the slow-footed, argumentative Maj. Gen. George B. McClellan into line. Grant had been in command at Memphis for only a short time. With wife Julia in tow, he rushed to Corinth, where he learned he was taking over much of Halleck’s old command In addition to the Army of the Tennessee, he would be in command of the Army of the Mississippi, Maj. Gen. John Pope having also been summoned east. Grant would now be in charge of a vast area encompassing north Mississippi, west Tennessee, and Kentucky west of the Cumberland River. Maj. Gen. Don Carlos Buell would have a separate command, meaning the Western Department would revert to the divided responsibility to which Halleck had successfully objected only months before. All this was good news and bad news for Grant. The good part was that the overbearing and underperforming Halleck would now be hundreds of miles away, still Grant’s commander, but less able to look over his shoulder and micro-manage him.. The bad news was that Halleck had broken up the massive force of 120,000 men that he had led into Corinth. He ordered its fragments to hunker down in defensive positions through the Western department, thereby forcing Grant into strictly defensive warfare. It was yet another of the war's might-have-beens, one of its greatest lost opportunities. It takes nerve to be a soldier, but not all nerves are alike. When nerve means courage or daring, it is useful in the conduct of war, but when it means arrogance or gall, it isn’t useful at all. In this, the second week of July 1862, both kinds are on display. Unfortunately for the Union this week, a Confederate is displaying notable acts of daring in the Western Theater, while in the Eastern Theater, a top commander iss displaying extraordinary arrogance. The fact that few Kentuckians rose and armed themselves on Morgan’s behalf did nothing to quiet the fears of Cincinnatians, who understandably feared that their important city had fallen squarely into Morgan’s sights.—especially after Morgan captured Lebanon, Kentucky on Saturday, July 12. Tompkinsville was about 180 miles from Cincinnati; Lebanon was about 65 miles closer. Morgan is a Southerner in the cavalier tradition: tall, handsome, daring, and courtly. His thousand-mile hit-and-run dash through a Kentucky dominated by Union forces is an act of pure nerve—and, although he will return to base in Tennessee without harming Ohio, he will return next year and do exactly that. Another kind of nerve is on stunning display hundreds of miles east, on the Virginia Peninsula. There, Maj. Gen. George B. McClellan (pictured upper right) and his huge Army of the Potomac have paused to catch their breath and decide what to do next. The Federals have been headed off, by Robert E. Lee, from their ultimate goal: the capture of the Confederate capital of Richmond. McClellan doesn’t realize it yet, but his elaborate, ponderous “Peninsula Campaign” has been for naught. This show is over. But instead of studying what went wrong in his command and figuring out how to do better, McClellan sits down, takes pen in hand, and presumes to tell President Abraham Lincoln what kind of war he should conduct and how to conduct it. He dares to tell the President what his goals should be—and freeing the slaves, Little Mac tells Lincoln, must not be one of them. The Union armies must fight only to reunite the country while inflicting a minimum of damage on the South. The strategy must be to maneuver Rebel armies into defeat, instead of destroying them. But McClellan exceeds his franchise by daring to tell the civilian government what its policies should be. This follows by a few days a telegram to Lincoln in which McClellan blamed the President for the losses on the Virginia Peninsula. Although McClellan’s forces outnumbered Lee’s, the union commander claimed he had been denied the reinforcements that would have made the vital difference. McClellan’s wire to Lincoln was so virulent that shocked War Department clerks deleted the worst of it before passing it on to the President. On Tuesday, July 8, Lincoln comes to the Virginia Peninsula to review the troops and meet with Mc Clellan. Lincoln is having increasing doubts about Little Mac, and although he isn’t ready to dump the cocky little Philadelphian quite yet, that day will come. On Friday, July 11, Maj. Gen. Henry W. Halleck, the Union’s top commander in Western Theater, is summoned east to become General-in-Chief of all the armies. Ever since McClellan was relieved of that post in March, Lincoln and Stanton have tried to fulfill its responsibilities themselves. 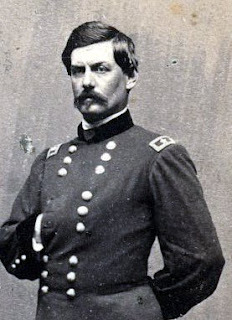 It has become obvious—especially with growing questions about McClellan—that a professional soldier is needed. For the moment, at least, Halleck is highly regarded—but he will be tested severely. OHIOANS ELSEWHERE IN THE CIVIL WAR: On Tuesday, July 8, Maj. Gen. Ulysses S. Grant, commander of the Army of the Tennessee, writes Ellen Ewing Sherman, now in residence in Lancaster, Ohio. Ellen has been campaigning to bring husband William Tecumseh Sherman home for a rest. Grant writes Ellen that he offered Cump a leave, but the offer was refused: Sherman claimed that “he was improving and would take good care of himself; and further his services could not be spared at this time.” So Grant and Sherman continue the struggle to contain Confederate activity in restless western Tennessee. From his perch atop Flat Top Mountain in western Virginia, Col. Rutherford B. Hayes of the 23rd Ohio is grasping that McClellan has been repulsed at Richmond, but is “relieved and satisfied” that McClellan’s army is still in good shape and good position. Hayes is hoping to be sent to eastern Virginia, where he can see more action, and, in fact, on Saturday, July 12, gets orders to move 14 miles down the mountain to a new camp. But Grant had promised, “In a few days I expect to have everything in order,” and so he has been busy. A provost guard has been given three regiments with which to keep order; Union soldiers have been ordered to behave themselves; local ministers have been told to stop leading prayers for the Confederacy (but prayers for the Union are not required); troops have been dispatched in various directions to protect roads, telegraph lines, and railroad track; cavalry has been sent into the countryside on scouting missions. But Grant's Army of the Tennessee is spread thin, unable to be everywhere at once. Confederate forces under Nathan Bedford Forrest and others continue to roam western Tennessee, cutting transportation lines, capturing supply convoys, and taking prisoners. Bands of Rebel cavalry are “as thick as thieves,” grumbles Maj. Ten. William Tecumseh Sherman in a letter to his wife, Ellen. One of Grant’s division commanders, Sherman on June 27 is about 40 miles from Memphis, sweating in intense heat and swatting at Confederate raiders like flies. Like Grant, Sherman has his hands full. His men had only just repaired some railroad bridges destroyed by the Confederates when the Rebels promptly derailed the only locomotive available to the Union forces in the area. “The Secesh” also captured a hundred Union men returning from furlough. And the news keeps getting worse. Confederate forces are said to be massing at Holly Springs, Mississippi, and Sherman will have to attack them. Making things worse is the scorching sun of early summer, so debilitating that that many of Sherman’s men collapse and have to be carried away in wagons. “I don’t think one half our force is fit for duty,” he tells Ellen. Sherman himself was so weakened by the sun that he, too, had to take to riding in a wagon instead of on his own horse. He tells Ellen that he has decided to replace the “small military cap” (a kepi) he had worn with a (wide-brimmed) straw hat from Memphis. ELSEWHERE WITH THE OHIOANS: Col. Rutherford B. Hayes and the 23rd Ohio continue to roost on Flat Top Mountain in western Virginia, enjoying the view and not doing much except looking for a new camping ground with a better water supply. All week, reports from McClellan’s campaign on the Virginia Peninsula reach Hayes’ isolated camp. The reports are mixed, to say the least: McClellan has entered Richmond, McClellan has been defeated, Richmond is burning, McClellan has lost 15,000 to 20,000 men and has retreated. ELSEWHERE IN THE CIVIL WAR: On Sunday, June 29, a disorganized Confederate pursuit keeps McClellan retreating, his rear guard fighting furiously. Most of the Federals get away, but 2,500 sick and wounded are left behind at Savage’s Station. The next day, a major battle erupts at Frayser’s Farm and, although Lee loses an opportunity here to split McClellan’s army, there is a larger meaning: a Confederate force has foiled McClellan’s ultimate objective and prevented an attack on Richmond by a larger Union force. 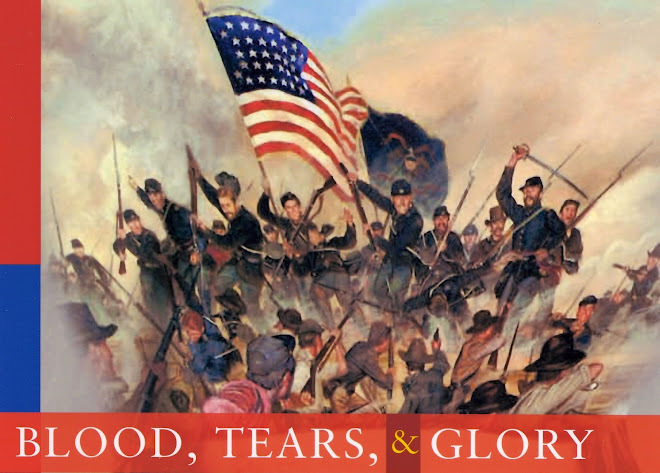 Tuesday, July 1, brings the Battle of Malvern Hill, the last of the Seven Days’ battles. From now on, McClellan is in sullen retreat, the Peninsula Campaign a failure.